Do you love body scrubs? Those containers filled with scrubbing goodness that leaves your skin silky soft, with a fragrance that feels like you’ve been wisked away to the spa? But spa trips can be expensive and the products can be just as costly. I’ve been making my own homemade body scrubs for years to save money and control the ingredients! So let me show you how to make your own homemade body scrub! 1. You should have on hand either Course Grain Mineral Salt or Epsom Salt . Both are known to be detoxifying and the coarseness of each helps give the scrub factor. 2. Also have on hand some body oil. Any kind of body oil will do, but good ones are almond oil, coconut oil, grapeseed oil, safflower oil, jojoba oil, avocado oil, peanut oil, rosehip oil, sesame oil, macadamia nut oil, sunflower oil and olive oil. I have a preference for jojoba. Its high stability, neutral scent and cosmetic versatility make it ideal for all skin and hair types. 3. Make sure you have a nice jar to put your DIY body scrub into. I personally love using bell jelly jars as they are pretty inexpensive. I especially love these blue ones on Amazon . They are so pretty! 4. Lastly, have essential oils. You can stick with one type of essential oil or you can have fun with some combinations depending on need, mood and desire. Plus, essential oils can be irritating to some, so make sure to try out a drop, mixed with oil, onto your skin to see if your skin is happy! Here are some great homemade body scrub recipes to try! Then place the product in a container. If you are giving as a gift, you can decorate the top with a homemade cover! Or tie with a pretty ribbon. Add a tag with the recipe too. Check out my Pinterest Board with cover ideas and other formulas for DIY body scrubs! (and I appreciate any follows!) Or better yet, check out my post on how to make your own lip gloss! These sound wonderful. I made my first scrub at Mom 2.0 and I had no idea how much I would love it! They really make you feel good! I make my own homemade scrubs a lot. I love making ones that use coffee – those are my favorites. It looks simple enough to make and lord knows I could use all four of the ingredients. I love natural remedy recipes. Especially ones that use essential oils. 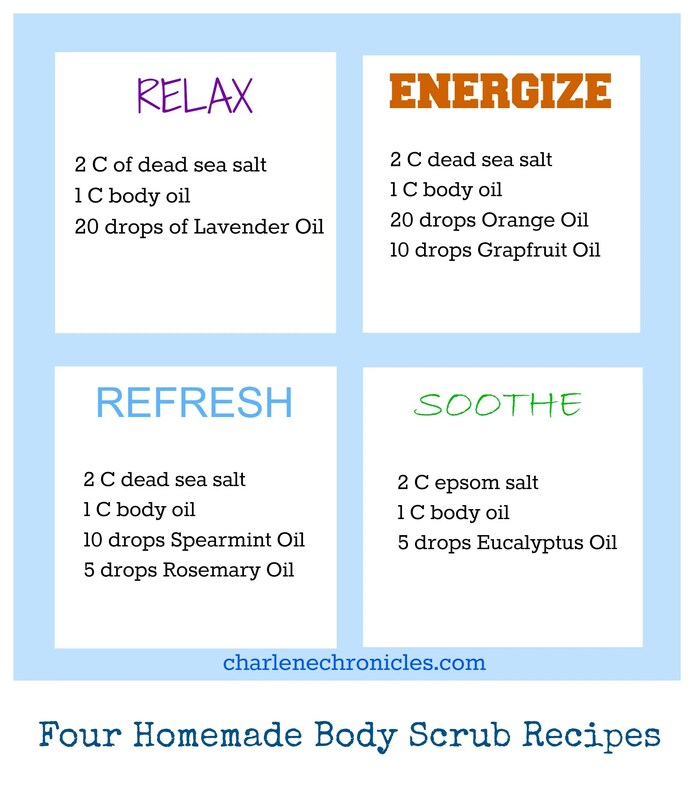 Thanks for sharing these great recipes for body scrubs. So cool and the most perfect Valentine’s Day present. 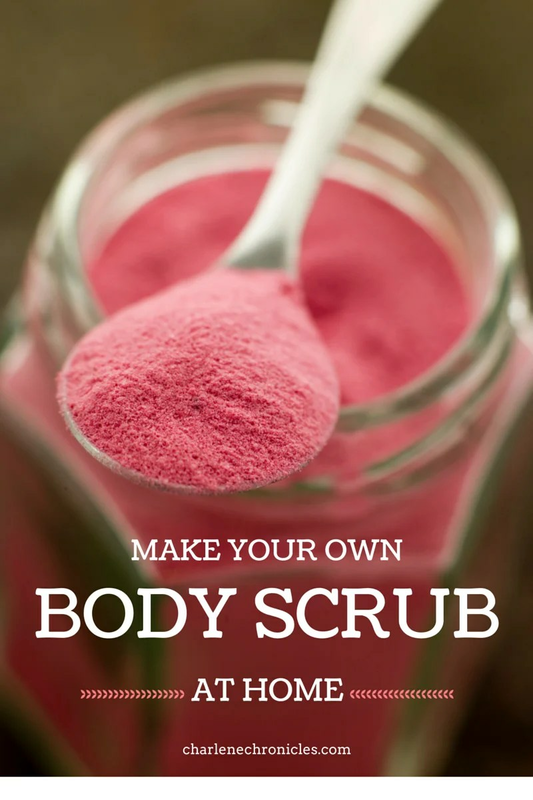 I love body scrubs, it is one of my favorite things to do at the spa but I love to use them at home too. I never thought about making them myself but those blue jars are just so cute!